Deciduous to evergreen, to 20 ft. (6 m). Zones 6 (with huge amounts of protection) to 10.
description: The rhizome is short-creeping. Eight-inch (20-cm) stipes, soft and apple green when unfurling, mature to brittle tan shoots. in indoor or warm situations the fronds grow just slightly slower than blackberry vines and, especially when given appropriate support, can twist and tower to 20 ft. (6 m). Outdoors in Zone 8, one or two fronds faithfully emerge in midsummer and, in a good year, will perhaps reach 2 ft. (60 cm). Six-parted leaflets are elongate triangles and have a long terminal lobe. Sori along the margins of the pinnules look like a series of minute thimbles. Green spores should be sown promptly upon maturing. range and habitat: This species is widespread on the margins of forests from eastern Asia to Japan, Korea, China, and the Philippines. It has escaped in the southeastern United States and Hawaii. Lygodium japonicum eagerly and easily climbs whenever provided with a structural support which may include, but is not limited to, other plants. 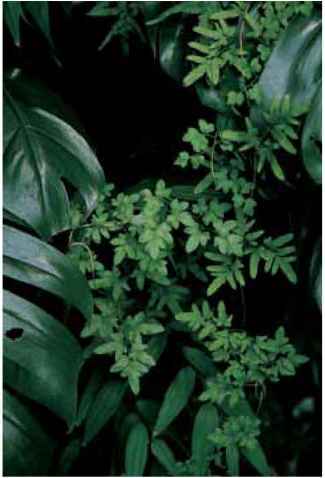 culture and comments: The Japanese climbing fern is an easily cultivated conversation piece indoors where it will, however, need a supporting framework. outdoors in cold zones it is self-maintaining, but in warmer areas needs the same attention as those growing indoors. To prevent an unsightly tangle of the old and the new it is essential to cut the old fronds back to the ground in late winter before the new growth takes off in the spring. Give it good composty soil and keep it moist. My plant has been in the same, albeit large, pot for over a dozen years with no fertilizer nor attention other than regular watering and an annual haircut. If the growth has been stunted it is not apparent. Epithet means "hand-shaped, palmate." Evergreen, 3 ft. (90 cm). Zones 3 to 9. A beautiful planting of the challenging Lygodium palmatum thrives in the carstensen garden. being translucent. For an outside chance at success, they need to be sown immediately. 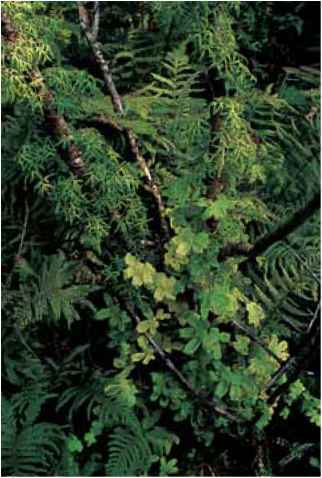 range and habitat: This is the only temperate climbing fern and is confined to habitats on the U.S. East Coast. It is very rare in nature, but where present is inexplicably abundant, spreading like netting across acres. Acid soil is mandatory and water must be free of lime (if need be, dipped from the rain barrel). 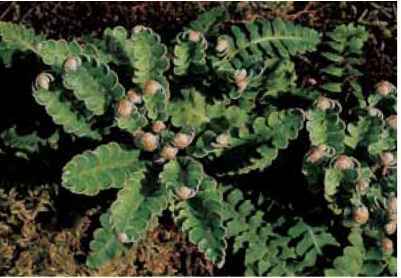 culture and comments: In short, this fern is a challenge to cultivate, although it can be done. German specialist Wolfram Gassner, who has an array of interesting plant material in his garden north of Hamburg, grows his specimen in a deep 16- to 20-in. (40- to 50-cm) container with no bottom drainage. 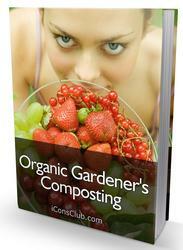 It is filled with peat and acid compost. He has drilled holes approximately 4 in. (10 cm) down from the pot's rim to drain excess water. The planting is not only alive and well but is a collector's showpiece. Gassner and Mother Nature water it with rainwater and it is not allowed to dry out. At one time in the United States, the foliage was collected extensively for decoration. The resultant decimation of natural populations prompted the passage in Connecticut in 1869 of the first U.S. plant protection conservation law.